Mac Security Plus is a rogue system optimization tool that promises to increase the system's security by displaying infected files. However, it reports about invented viruses to scare its victim into purchasing its license. Make sure you delete this PUP without dealing with it. Mac Security Plus virus is a rogue tool that seems to be useful but is not capable of improving the work of your Mac device. Mac Security Plus virus is an unwanted program seeking to misuse users' inability to identify viruses on the system. However, entries detected by this application as malicious should not be removed because they are legitimate or harmless system components. By warning its victim about the possible dangers, Mac Security Plus is seeking to mislead its victim into buying its fake license. If you don't want to spend your money on useless software, make sure you stay away from this PUP. Often, the virus gets into the system without users' consent because it has been actively using bundling to spread around. In addition, this rogue optimization tool displays fake alerts about possible infections and then asks to pay for its full version. Although the app seems legit, don't leave it on your Mac device. Although MacSecurityPlus has been actively presented as a useful addition to MacOS system, don't get fooled. There are tons of similar system optimization tools spreading on the Internet and seeking to steal users' money. Typically, they have no virus database and malware, which is typically reported, is simple system components. Having in mind that the Mac operating system is quite safe, there is no need to deal with questionable software. It appears that MacSecurityPlus can even slow down the performance of your device. However, its main aim is to mislead Mac users into thinking that their system is infected and purchasing the full version is the only way to get rid of “viruses.” Most likely there are no malicious files on your device, and the only intruder you need to remove is the rogue tool itself. To make sure that your files are safe, invest in good Mac antivirus capable of disabling viruses before they get into the system. Besides, you should remove Mac Security Plus malware by uninstalling it from Mac or using automatic software capable of fixing your system automatically. However, don't let this tool stay on your computer as you can put your entire system into danger. If you are looking for a tool for Mac Security Plus removal from Mac, we can recommend using Reimage which will repair your system by clicking only one button. However, you can also try to find its entries manually. Most of them can be found in Library/LaunchAgents and Library/Application Support folders. If you find anything related to this PUP, send them to Trash. Additionally, check your web browser settings and reset them if you find them altered by the virus. Complete the removal by emptying the Trash. After you finish automatic Mac Security Plus removal, keep in mind that you must start taking appropriate attention to your Mac's security. These computers are not immune to malware, PUPs, and similar infections, no matter how popular the belief that Macs do not have viruses is. Based on this fact, you need to find a good anti-virus tool and run daily or weekly system checks. 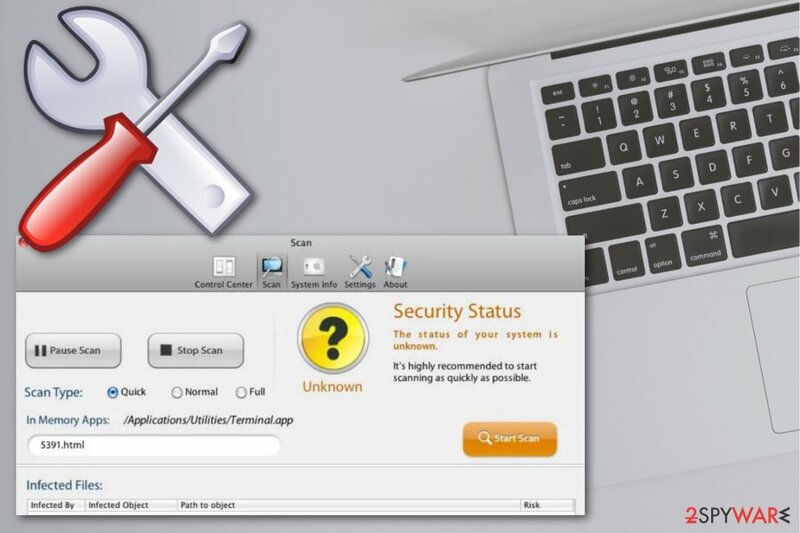 Mac Security Plus virus is an unwanted program that infiltrates system without user's knowledge and additionally delivers fake scan results to make people eager to pay for its full version. When you browse online and get redirected to a suspicious website or your screen gets filled with intrusive advertisements, banners, pop-ups, pay more attention. If you click on this content, you may automatically download files or programs you don't want. Additionally, when you install freeware from the internet, you risk getting unwanted products because of software bundling technique that is reported by experts as the main PUP distribution method. If you choose Advanced or Custom options during the installation, you can avoid the infiltration and keep your device secure. Remember that having Mac OS supporting device is not ensuring that your machine cannot get infected by cyber threats. Keep your program up-to-date using official providers and keep the antivirus program on the system; run a full system scan occasionally. The best and the easiest way for Mac Security Plus removal is installing reputable Mac anti-virus and running a full system scan. The full system scan will help you indicate all possible threats, including this rogue software and other unwanted entries. In addition, keep the program on board to protect your computer from future attacks. If you are willing to remove Mac Security Plus manually, use steps given below. You should also check Library/LaunchAgents and Library/Application Support folders and get rid of PUP-related entries. When all possible intruders are deleted, we also recommend resetting web browsers, especially if they have been displaying unwanted ads after you noticed the infiltration of Mac Security Plus. Get rid of Mac Security Plus by using the guide given below. Make sure you remove all suspicious entries. Wait until you see Applications folder and look for Mac Security Plus or any other suspicious programs on it. Now right click on every of such entries and select Move to Trash. ^ Lily Hay Newman. Malware has a new way to hide on your Mac. Wired. Stories from the future. ^ Popular Mac viruses, malware and security flaws. Macpaw. Keep your Mac in perfect shape. This entry was posted on 2019-01-31 at 08:56 and is filed under Mac Viruses, System tools, Viruses. You can quickly scan the QR code with your mobile device and have Mac Security Plus manual removal instructions right in your pocket. How did you remove Mac Security Plus?